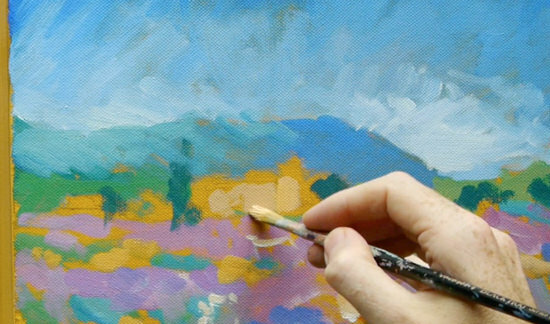 In this painterly, impressionistic landscape series, I am posting a weekly video on my YouTube channel so that you can follow along at home. 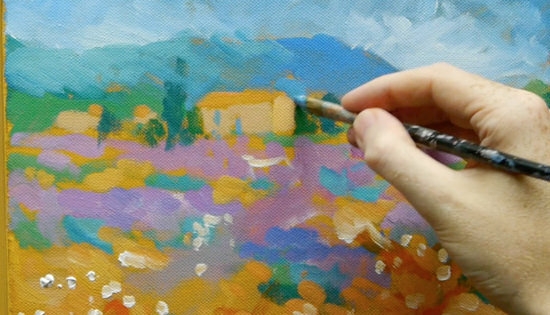 This video below shows the next steps I take to build up this impressionistic landscape painting. I mix a lilac using Cobalt violet hue and Titanium white. We are just blocking in the colours using short marks that leave some of the yellow ochre underpainting shining through, to get a feel for the colour harmony of the piece. If you notice, on my brush each side has a different colour. 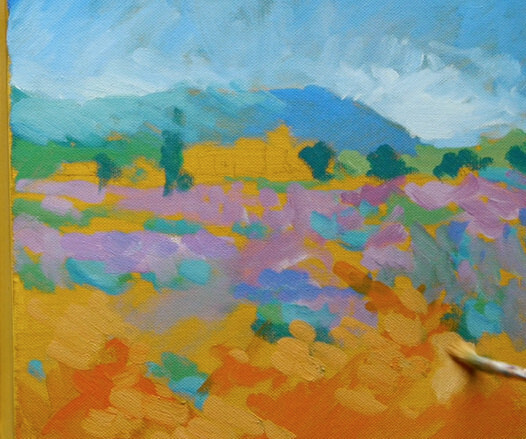 I had dipped one side into the green mix and then twiddled the brush in my fingers to load up with some of the purple colour. Pro tip: This technique can be very useful when depicting waves on a seascape when using a flat brush. Load up one edge with a white and the other edge with whichever blue you are painting with. 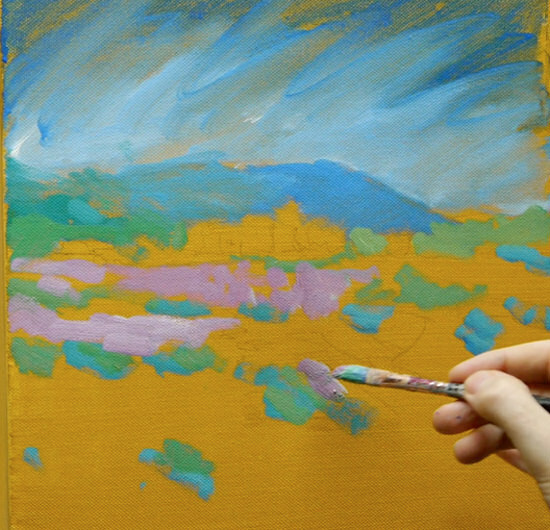 You can then create a mixture of colours just using one stroke of the brush. 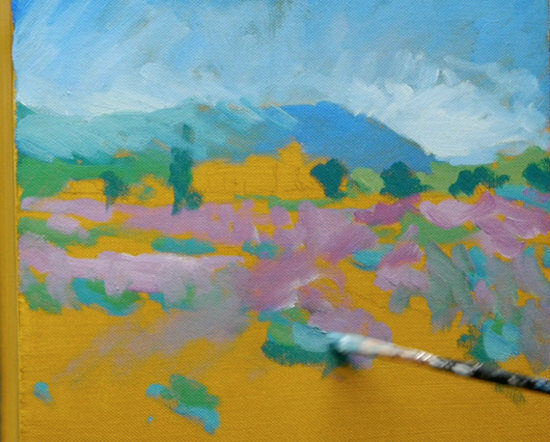 Now we have some of the foreground lilacs in the painting, it’s easier for me to judge how light or dark to go in the sky, so I can start to work with thicker paint to add some movement. Don’t forget the reference photo is just a guide, don’t get too hung up if the shapes aren’t exactly right. 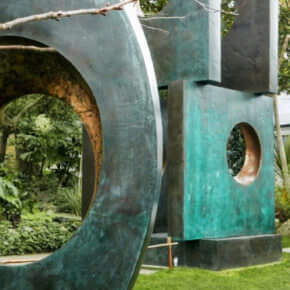 In landscape painting, the corners are very important. 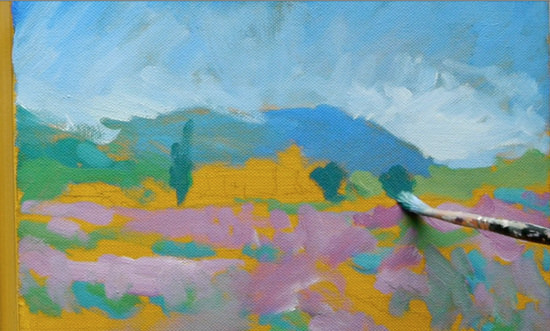 I often darken the corners to help bring the viewers eye back into the piece, particularly when the sky is very simple. 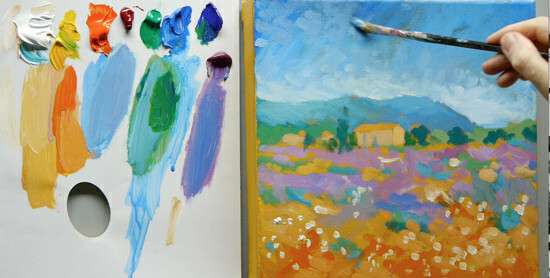 In this lesson, it helps to draw focus to the building in the middle of the painting. In the next step, we can start to introduce darker tones to enhance the focal point. 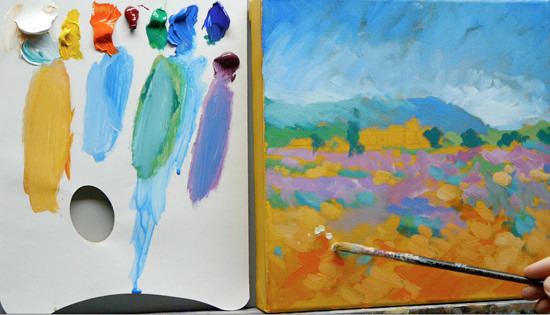 Using a mix of the Permanent Green Light and the Ultramarine Blue (the darker of the two blues we’re using) I can create a mix similar to Viridian that Monet used on his palette. Another alternative green is Phthalo Green which is very close in tone to Viridian. Notice how the dark green shapes now surround the building, this contrast will help later on in the painting. I then start to apply thicker paint than before and correct some of the drawing on the mountain. I mix a turquoise using the Permanent Green Light and the Cobalt Blue. 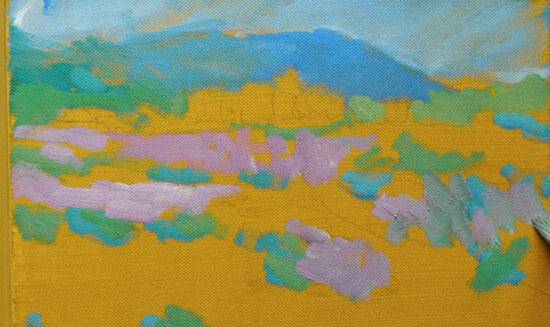 When this colour is mixed I scan the reference image for any examples of this colour appearing in the foreground of the piece. 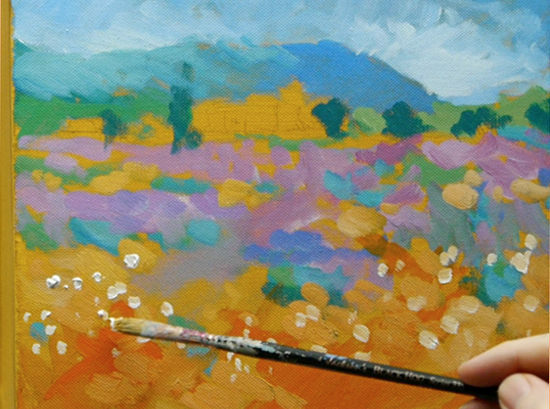 This helps to unify the painting and give a movement of colours throughout the painting. 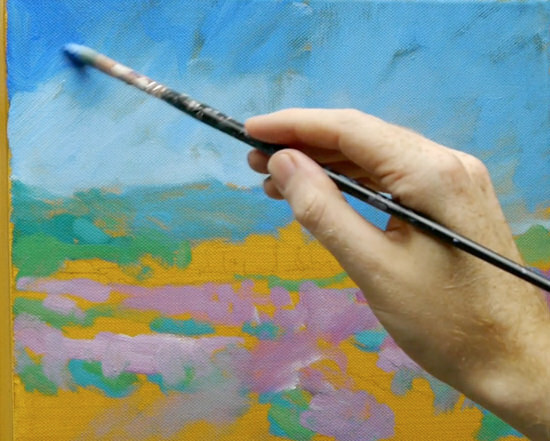 I use short strokes to apply the paint slightly more impasto (thicker) than the initial wash in. 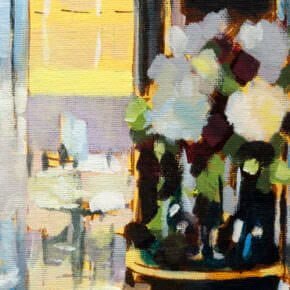 These dabs of colour help to move the viewers eye around the painting, I add white to the mixture to vary the tints slightly. 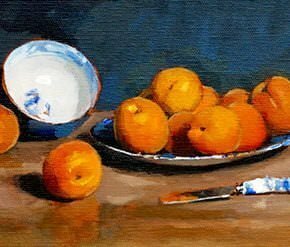 Using a watery mix of the Cadmium Red Light and the Cadmium Yellow Medium, I mix an orange that I can block in to create a strongly coloured undertone for the lighter, more impasto brush marks that come next. 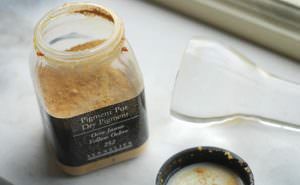 I then use the same principle of optical mixing using broken colours, by dabbing thicker, lighter, yellower paint on top. 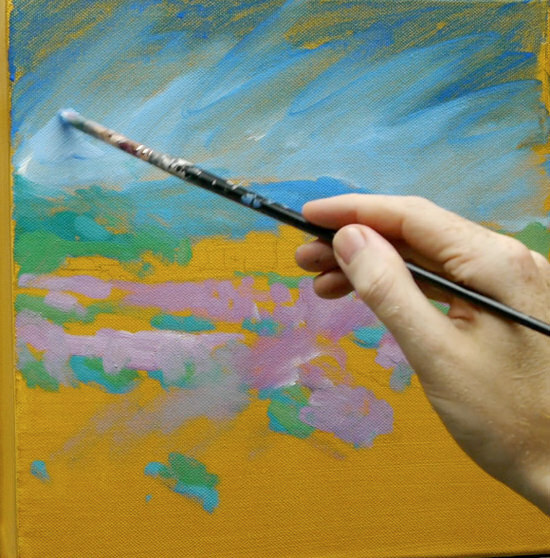 This is exactly the same technique as when we applied a coloured ground to start the painting. 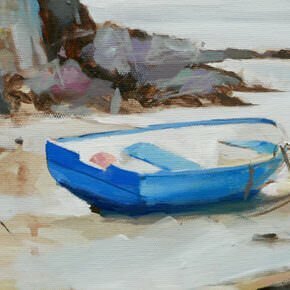 The great thing about acrylics is you can apply theses little areas of intense colour to other parts of your paintings to add interest and contrast. You can see how Van Gogh used a similar technique here. Using quite a thick paint on my brush, I then gently dab thick, white flecks of colour to give the impression of flower heads. 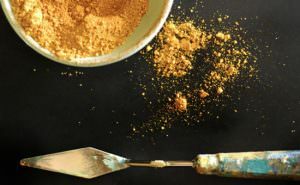 I mix a cream using the white, yellow and a touch of the Cadmium Red Light for the side of the building being hit by the sunshine. For the shadow side of the building, I simply mix in a touch of the Cobalt violet. As purple is the complementary colour of yellow it helps to darken it down and produce a shadow that still has colour in it. I then refine the edges of the building and add detail using a mix of Cobalt Blue and white. To finish off the sky, I mix in a bit of the Cobalt violet to create a more muted blue so it balances with the rest of the painting. I also vary the direction of the brushstrokes to add interest. 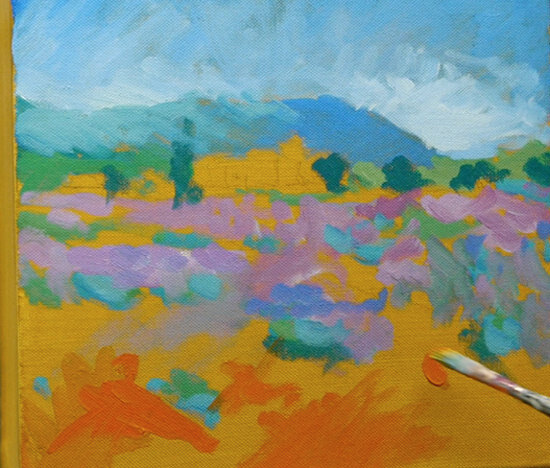 The impressionist painting at the end of Part 2. Next week, for Part 3, we’ll start to add more details and complementary colours to bring it to more a finish. Will, thank you for sharing your awesome talent in such an easy to follow format! You have taken all the fear out of learning to paint! You’re welcome, so pleased the tutorials are helping to take the fear factor out of painting. Taking things one step at a time can really produce some fantastic results. I deeply appreciate you lessons, very helpful, free, the best training courses and techniques. I am using all of your guidelines, which have not been able to find, anywhere else. By the way, would you please tell us what kind of canvases are you using? the texture is very nice helping the shades look three dimensional? Thanks for your kind words on the painting tutorials. The canvas I’m using is a pre-primed Winsor & newton 12 x 12 inch deep edge canvas. Cheers Tom, great to hear it’s easy to understand. I’m a professional artist of 30+ years and I can still learn a lot from other artists, but I find your videos especially inspiring. I also love your peaceful tone of voice. Thanks for not skipping any steps and letting us watch the whole process. Paint on! 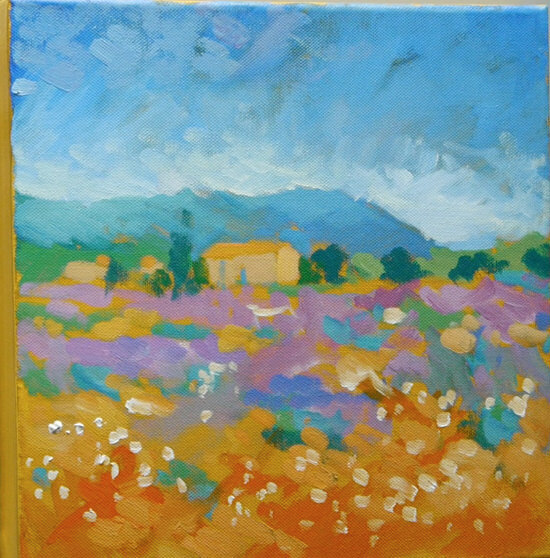 Thanks very much Elizabeth, much appreciated, really pleased you enjoyed the painting. So much fun! Thank you so much! Thanks Elizabeth, pleased ou enjoyed it. I’m an sculptor and I’ve recently started painting too, since I’ve always loved to. this is really lovely to see how you break into steps and make it easy and simple to understand and follow. the videos are so motivating as you yourself are, I’m sure. you are the best example of this quote in the painting. All the paintings can be considered finished in all the steps. just wanted to thank you for being so generous and motivated at the same time. I’d also love to see your own paintings and know your taste as an artist. Really pleased you’ve been enjoying the lessons Afra and glad you’ve found the steps helpful. last Christmas! Long Live Monet!! Really pleased you enjoyed it Karen! 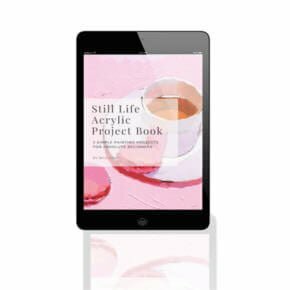 great that you’ve been finding the lessons helpful in creating new works.